Showing items tagged with "email management training" - 25 found. 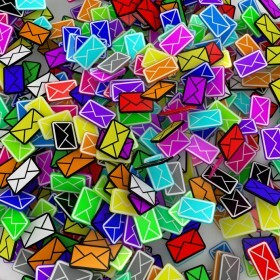 Is email yesterday’s technology and will email overload soon be a thing of the past? Maybe for Generation K – teenagers. However, four recent studies on email overload and email traffic suggest that this is definitely not the case see below. 1. Email alert: full inboxes leave staff exhausted. Professor Cary Cooper pronounced that email is sapping the life out of the British workforce. It is one reason why British productivity is the lowest in the G7 group. Germany and France are taking action to reduce the email overload malaise, but few UK based companies are doing anything. Sir Cary says ‘companies need to take drastic action’. 2. Here are some of the findings from a fascinating new study of the email behaviour of over 2 million users by a group of researchers at Yahoo and the University of Southern California. As the volume of emails received goes up, so we respond to fewer and fewer and in some cases as few as 5%. Emails sent early in the day are more likely to be replied to than those sent later in the day. Response times range from 13 minutes for Generations Z and Millennials and about 47 minutes for Generations X and Y. Replies get shorter as the conversation goes on and the volume of emails increases. Replies to emails sent over the weekend or late at night are likely to be shorter than those sent during the working day. 2. The overall volume of emails sent and received is predicted to grow by 3% year on year between 2015 and 2019 according to the Radicati Groups latest email statistics report. This may be a small increase but nonetheless it is still up rather than down. 3. Pointless emails are common. A study focused on British email users (by Sennheiser) found that of 2,000 business users one third felt there was always someone in their team who sent pointless emails (eg the photo copier is broken) when an alternative more effective method could be used. 38% confessed to sending an email which started an email war and 25% said they used email instead of talking because they were emailing about a person sitting close by! Even if you only receive half the number of emails identified in these studies that is 50 per day and 10,000+ per year. If you are a manger the volume will be higher and the email overload more pronounced. There are important lessons to be drawn from these studies, not least about email etiquette, the risk of missing important emails as email traffic increases and the impact of email overload on business and personal productivity and finding key emails when needed to support your reason for actions taken. Simply banning email is not a solution as the Grossman Group pointed out. The solution is to change the email culture and enable people to use email more responsibility. Know when to stop an email chain and talk, no reply is required, etc. These are challenges which Mesmo Consultancy regularly addresses in its email management training webinars, workshops and one-to-one coaching. If these are issues you face then why not call us now to hear how we have helped other clients like you? Over fifteen years of writing two books on email best practice and many articles, not surprisingly I have files full of email media disasters from the early stories of naughty Claire Swire emails to the more serious ones where Kirsty Walk asked her PA to hack into someone else’s inbox to retrieve some damaging emails. When will we learn that no matter how hard we try to erase an email we wish we had never sent, someone will have a copy. Furthermore as we become increasingly litigiousness many organisation now archive all email traffic in and out of their servers. Two press stories prompted me to write again on this topic. First, there is the phone hacking trial in which copious evidence is email related. At one point the management team tried to destroy all old emails only to find not surprisingly that they had been archived by their mail provider. Second, was the recent email trail between Ed Miliband and a senior aide which branded Ed Balls as a ‘nightmare’. This was a classic case of not only putting something stupid into an email but then compounding the felony by sending it to the wrong person! What can we do to avoid such email scandals which seem to now occur regularly? Recall the email. No that doesn’t work as I now have it and am intrigued why you are recalling it. Pause before hitting send and ask yourself what will be the consequence if this email is taken out of context? Is this something that I want other people to know about? Write a rules which sends all your emails to the draft box before they actually leave your device. Check and re-check that you are sending the email to the right Frank Smith/Jane Wise. Most people feel compelled to either reply instantly they receive a new email or fire off an email when feeling cross. This usually results in unnecessary emails chains which often spiral into email wars and drive up the email overload. There is a time and place for chatting and gossip but email is not that place. Do you want to reduce the risk that someone in your organisation will make an email faux pass? Call us now and ask about how our Brilliant Email Management masterclass can help you and your organisation prevent such email disasters (which are often very expensive in terms of damage limitation PR and putting people on gardening leave). Meanwhile, dare to share, what are your tips for avoiding an email disaster? Have you ever been subject such an email scandal? ‘Hell’ was the email greeting instead of ‘Hello’. The Board were asked to line up their ‘dicks’ instead of their ducks’ ahead of a board meeting. Visitors were asked what size ‘willie’ would they like rather than ‘wellington’ boots. The IT department apologised in advance of weekend maintenance for the ‘incontinence’ rather than ‘inconvenience’. The moral of these email faux pas is not only to think before hitting send, but watch carefully as you spell check your email. Paying attention, pays dividends when it comes to email etiquette and preserving your image – both your own and the company’s. 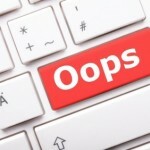 Dare to share email mistakes like these either that have been sent to you or you have sent to others? Copy of ‘Brilliant Email’ for the best one.